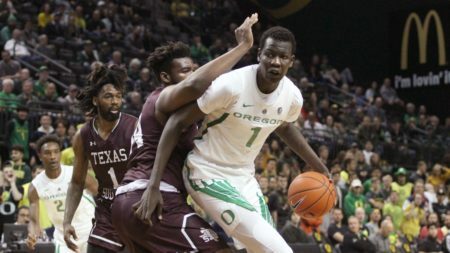 Perhaps it shouldn’t be such a surprise that Texas Southern would come into Matthew Knight Arena and give the Ducks all they could handle. Last season, the Tigers went to the NCAA tourney and almost upset Oregon early in that year. They also upset Baylor in Waco to open this season. Well, Texas Southern just pulled off its second upset of the young campaign with an 89-84 win over the No. 18 Ducks in front of 6,926 fans that went home disappointed. Oregon (4-2) wasted a career-high 32 points from Bol Bol, but his 7-2 counterpart on the other team, had a monster game of his own. Trayvon Reed was perfect from the field (9-9) and from the free throw line (5-5) to go for 23 points and seven rebounds. Tigers guard John Jones seemingly shapeshifted into Steph Curry by hitting big shot after big shot to erase a 10-point second half deficit. The 6-foot guard scored 20 points on the night going 7-of-11 from the field, including a trio of treys. The Ducks held a 39-32 halftime lead, but Texas Southern outscored them 57-45 in the second half. Oregon also came into the game leading the country in defensive field goal percentage, allowing opponents to shoot just 32 percent. The Tigers (2-4) ended the night shooting 58 percent in the second half and 48 percent for the game. The defending SWAC champs also outrebounded the bigger Oregon team 41-32. Despite Bol’s 32 points, offensive production for the Ducks was at a premium. Payton Pritchard scored 14 with Will Richardson and Victor Bailey, Jr. each added 13. Paul White managed eight. What hurt the Ducks’ offense was both Ehab Amin and Kenny Wooten were held scoreless. Wooten didn’t play in the second half as he banged up his knee right behind halftime. His absence left a gaping hole in the middle on defense and Texas Southern took full advantage. Reed scored 14 points after halftime. For a while, the Ducks had this game under control. When Abu Kijab managed lay-in off of a turnover, Oregon had a 51-38 lead with 16:28 left. That was when everything went up in smoke for the Ducks. Texas Southern went on a 13-3 run to pull within three at 54-51 just four minutes later. Oregon was able to hold the lead for another two minutes, but when Reed dunked in on a lob, it was 59-59 with 10:24 remaining. It was officially game on. The two teams went back and forth for a bit, but when Jayln Patterson knocked down a trey at the 8:56 mark to give Texas Southern a 66-64 lead, the Tigers never trailed again. Oregon did manage to tie the game back up when Bol nailed his fourth three of the game to make it 73-73 with 3:12 left. Texas Southern was able to go to Reed inside for yet another dunk to gain the lead right back. The big center then hit his foul shots, something he didn’t do before tonight. Reed entered the game 8-of-16 from the charity stripe, but hit all five attempts against Oregon. The last two minutes turned into a free throw shooting contest and Texas Southern sank 8-of-10 shots to seal the upset win. Oregon will now try to put that loss behind and prepare for a tough road game at Houston on Saturday (6 pm, ESPN2). The Cougars are 4-0, including a win at BYU. It’ll also be the opening game in their renovated facility, now called the Fertitta Center, which seats close to 9,000 Cougar faithful.